3 weeks ago, I unsubscribed 1/3 of my mailing list. And later on, I'll give you 5 reasons why you should do the same (let go of inactive subscribers). 0.25% is the average that will unsubscribe themselves without being prompted. (Source) 0.25%!! Some subscribers will potty-squat forever, see your emails and never open them. It's up to you to start the conversation and find out if you're still the right fit for one another. (Your brand, direction & vision). Now, I didn't have a massive list. I was in the low 100's and it still didn't stop me from removing inactive subscribers. Maybe the opt-in freebie I offered didn't align with what I do regularly. Maybe they lost interest and their priorities changed. Or maybe, all my emails were hitting their spam folder (or in an unroll.me digest). Whatever the reason, I'm not paying for it anymore. A low open rate means lower engagement. Now, I'm not caught up in list sizes. It does nothing for my ego. I'm more concerned about connection and co-creating, especially when I choose to work with 3 client projects/month. And I can't do either of those things with a sleeping list, massive or pint-size. Depending on where you're at in your business, determines where you place the most focus & attention. Do you sell more products? Then you may need to focus on list building strategies. Do you offer boutique services (like me)? Engagement should drive you. Both are necessary to reach your audience, so balance is essential. Email conversion rates are three times higher than social media, with a 17% higher value in the conversion. (Source) Mailing lists are still the best way to acquire new clients BUT they have to be opening your thought-provoking emails to know you exist. If I ever intend to grow beyond the low 100's...I needed to re-engage the inactive subscribers and pull in more raving readers. My mission is to reach the ears of those who have a message. I did the first option and sent out this email, Subject: Are we breaking up? And a second follow-up email afterwards. I was able to re-engage 5% and the rest, 3 stars and under were selected and unsubscribed by me. Keep in mind, the third of the people (on my mailing list) who received this email have not opened the last 10 campaigns sent to them. I send weekly emails. That's 10 weeks of not caring about what I poured my soul into. How to sniff out the squatters on MailChimp. The next step was to pull in raving readers. The 1/3 of the list I unsubscribed --got replaced instantly. I swear every time someone unsubscribes from my list I get 2 more in return. If they're not reading your stuff, they can't get to know you and the services you offer. Therefore, can't buy nada. Financially: if you have a paid account, every time you send an email to someone who will never open it --you're losing money. Energetically: they are filling a space that could be saved for someone who would actually show up to eat, be merry and bring a dish to the dinner party. This allows you to re-evaluate the content you share and offer your readers on a gold nugget level. Since I dropped the dead weight, I was able to re-engage with you and new readers on a more intimate level. And it feels amazing! I hope you're feeling it too. If not, hit me up and let's fix that! This might just be the best thing that could ever happen & grow your business considerably (it was for me). Here's your assignment: Comment below. 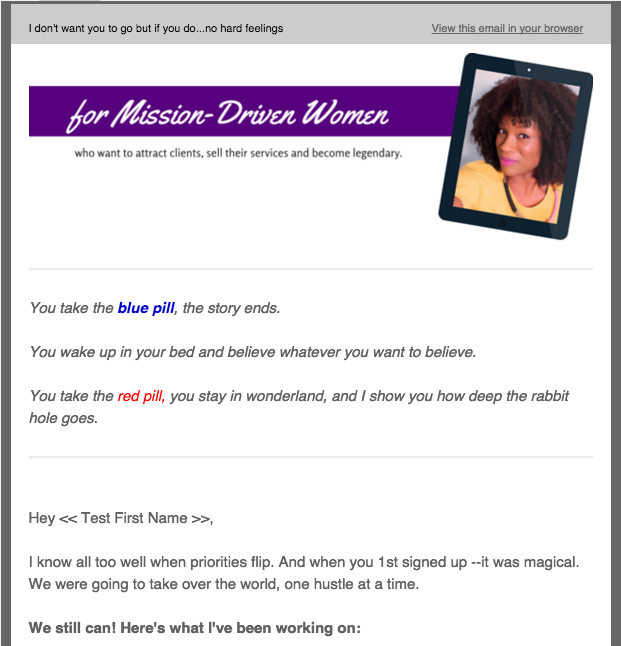 How active is your mailing list and what freebie will you create to pump it up?